Play out life with Disney Princess Cinderella and Prince Charming in their castle. Help them dine together in the grand dining hall before heading out to the revolving dancefloor on the balcony. Find the cheeky mice and feed them some cheese, then visit Cinderella's foal and help him practice over the jump or pull the cart. Enjoy building this set in different ways, moving and swapping the pieces inside and even rearranging the rooms of the castle—there's so much to explore and discover! Price is 32% below the initial Lego retail price, a € 27.21 discount! This comes down to 9.88 cent per brick. The Cinderella's Dream Castle (41154) Lego set is available from the sites below. However, they do not offer delivery to your selected region. The Cinderella's Dream Castle (41154) Lego set is no longer directly available from the sites below. However, 3rd party partners of these sites might still have the set available. Alternate description Dine and dance at the Dream Castle with Disney Cinderella. Includes Cinderella and Prince Charming mini-doll figures, plus a foal and 2 mice figures. Features a modular 3-story castle, pumpkin patch, horse jump, and a cart that can be pulled by the foal. Castle features a dining area with table and chairs, bedroom with opening secret compartment in the bed, turning fireplace with secret hiding place, balcony with revolving dancefloor, kitchen, dressing area with vanity, and a lounge area with chaise longue. Accessory elements include a glass slipper tile, opening book, invitation tile, perfume bottles, jewel, hairbrush, hair bows, croissants, cookies, cheese, pumpkins, water bottle, cooking pot, pan and glasses. Customize the set by easily swapping and rearranging internal features such as the throne, stove, vanity and bench. 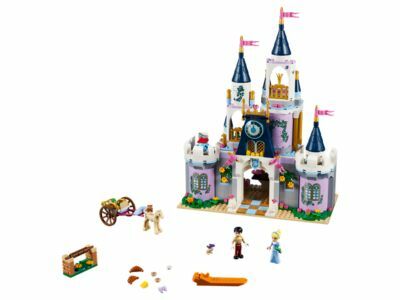 Move and rearrange the rooms to create a new castle every time, or combine, swap and mix this model with other compatible LEGO® l Disney toys to build your own dream creations. Recreate scenes from Disney's Cinderella with these much-loved characters, or create new role-play stories of your own. Help Cinderella and Prince Charming dance all night on the revolving dancefloor, then head to the kitchen to wash the dishes. Take care of the foal and attach the cart to help him pull it along! This popular toy for kids is suitable for ages 6-12. Cinderella's Dream Castle measures over 13” (34cm) high, 9” (25cm) wide and 4” (12cm) deep. Cart (without horse) measures over 1” (4cm) high, 3” (9cm) long and 1” (5cm) wide.